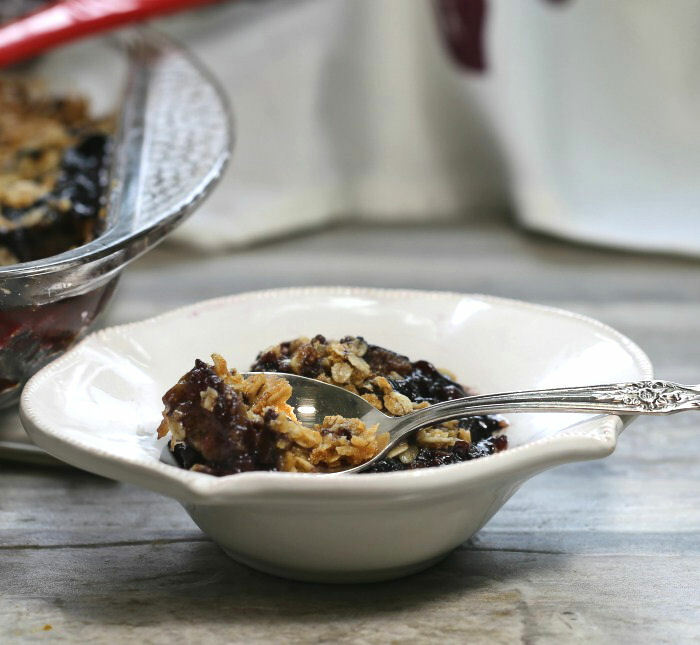 This fig crumble is both tart and sweet with a crunchy oat topping. Serve it with some whipped cream or ice cream for a delightful summer dessert. 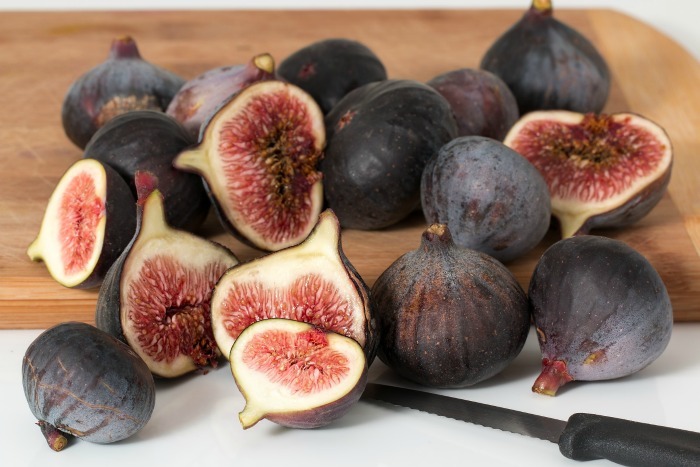 One of the true beauties of this rich dessert is that the figs that I used were very ripe. This made for a wonderful syrup like filling that rises up to envelop the crumble, giving the dish great taste and a fabulous texture in every bite. 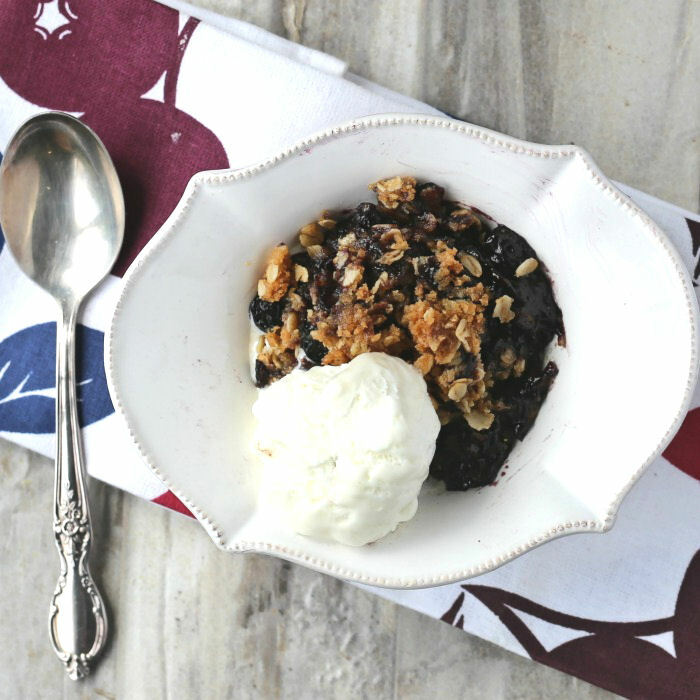 Fruit crumbles are easy to make and super tasty. They combine the flavor of fresh fruit with a golden brown topping that uses butter, flour and sugar. 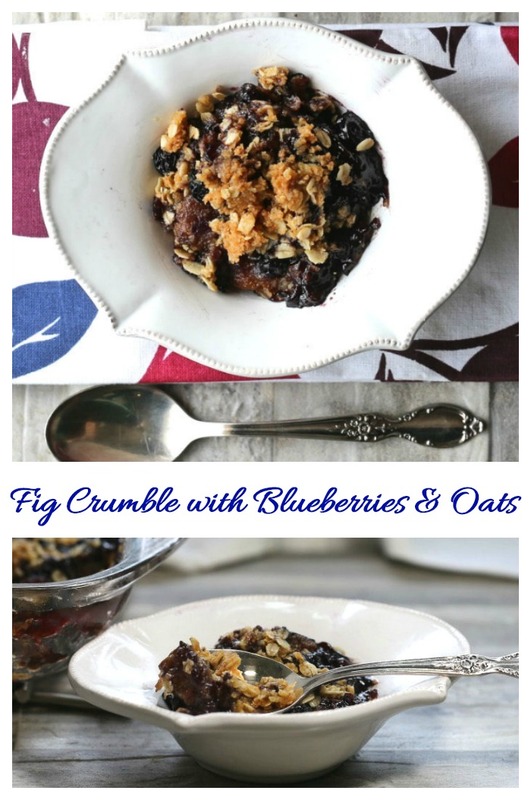 This blueberry fig crumble also adds in some heart healthy old fashioned oats for a hearty finish. I often make apple crumbles, since I can get fresh apples all year long. For today’s dessert, I will be using fresh figs. My husband came home the other day with a whole pan full of fresh figs that a friend of his gave him. 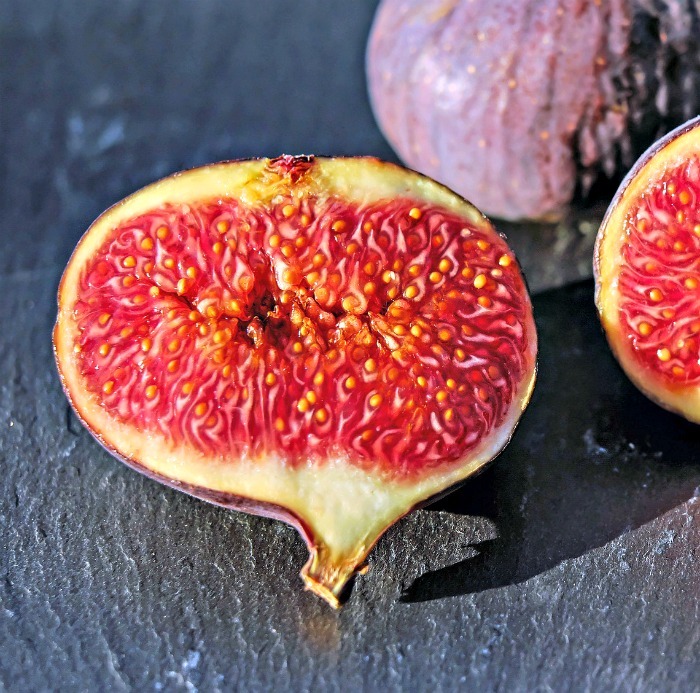 Fresh figs are high in fiber and a great source of some essential minerals, such as magnesium, manganese, and calcium. I love adding fruit like this to desserts to get the health benefits. What do fresh figs taste like? 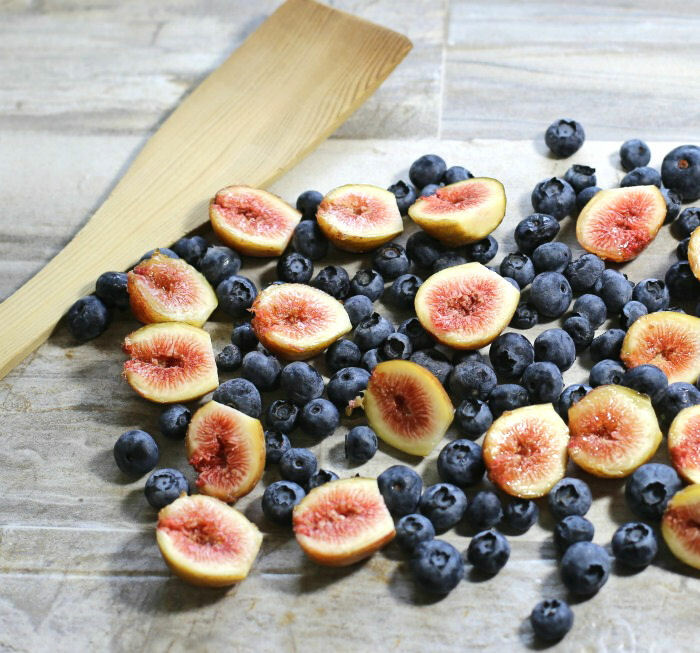 Most of us have had dried figs – perhaps in fig newtons or other fruit cookie. But fresh figs are something else indeed. Figs are actually inverted flowers with a mass of unopened blooms which line the wall of the fruit. The taste is sweet with a honey like taste and a subtle hint of berries. The flesh of a ripe fig is pulpy with that jelly like syrup. It’s also a little grainy from all the seeds that each fig contains. This makes it perfect for crumbles which are best with a syrupy filling. Putting together a crumble is as easy as a dessert can get. Lay some fruit in a baking dish, combine the toppings in a food processor and combine. In addition to the fresh figs, I also used a couple of pints of fresh blueberries. Blueberries are made for crumbles, in my opinion. The two flavors are really great together and give the dessert a tart/sweet combination that can’t be beat. I also love the color contrast of the two fruits! To start, combine the whole wheat pastry flour, brown sugar and sea salt in a food processor. Streusel toppings are so easy to make using this handy appliance. Pulse the mixture a few times until the texture is nice and crumbly. But wait – we’re not done yet. 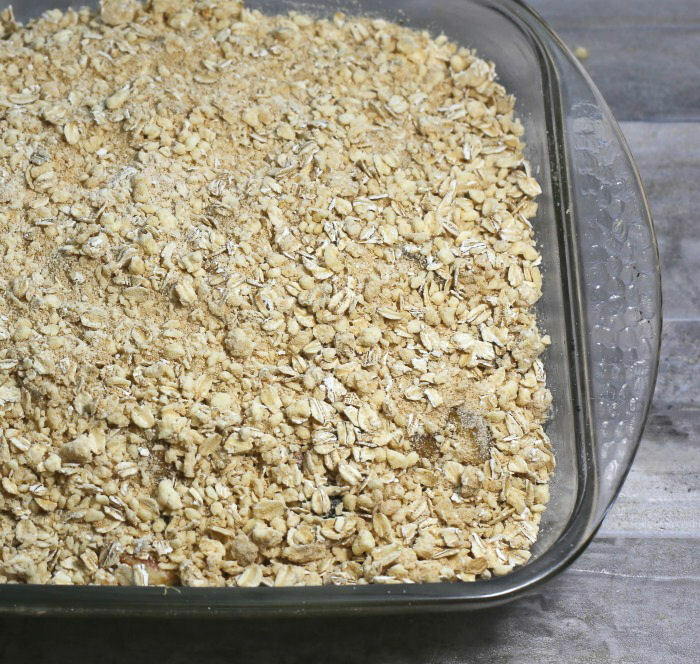 I also added in some heart healthy oats to give extra texture and fiber to the topping. The finished crumble with have the texture of coarse cornmeal with lumps of buttery oats throughout. It’s best to put the crumble into the fridge to keep the butter cold while you prepare the fruit filling. This will ensure that the pieces of butter stay intact, making for a crisper crumble when it’s cooked. The figs and blueberries go into a large oven proof baking dish that has been sprayed with cooking spray. They get tossed with brown sugar, cornstarch, vanilla extract and bright lemon zest. The lemon zest adds a nice bright finish and the cornstarch will thicken the filling during cooking as the fruits ooze out their liquid. 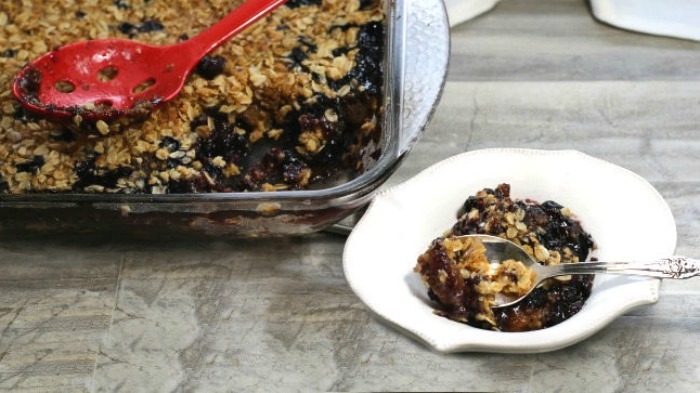 The last step is to spread the prepared crumble topping over the fruit mixture and bake in the oven for 60 minutes until the filling is thick and syrupy and the topping is lightly browned and crisp. Even though the topping looks dry now, that buttery flavor will permeate the flour, sugar and oats as they cook for a lovely buttery top to this dessert that pairs perfectly with the sweet and tart fruit. The syrupy nature of the figs makes the filling rise up to encompass the filling as it cooks. 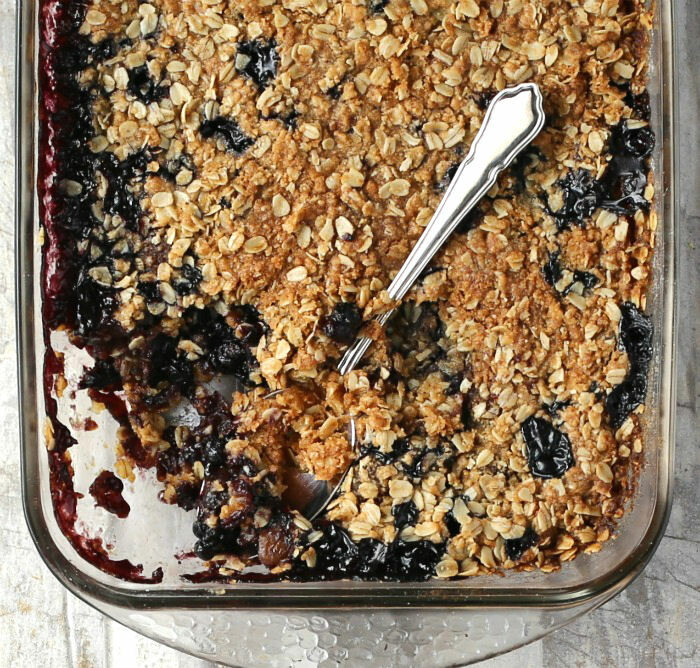 This leaves some of the crunchy bits sitting on the top and more of the crumble mixing with the fruit to make each bite just full of texture and flavor. 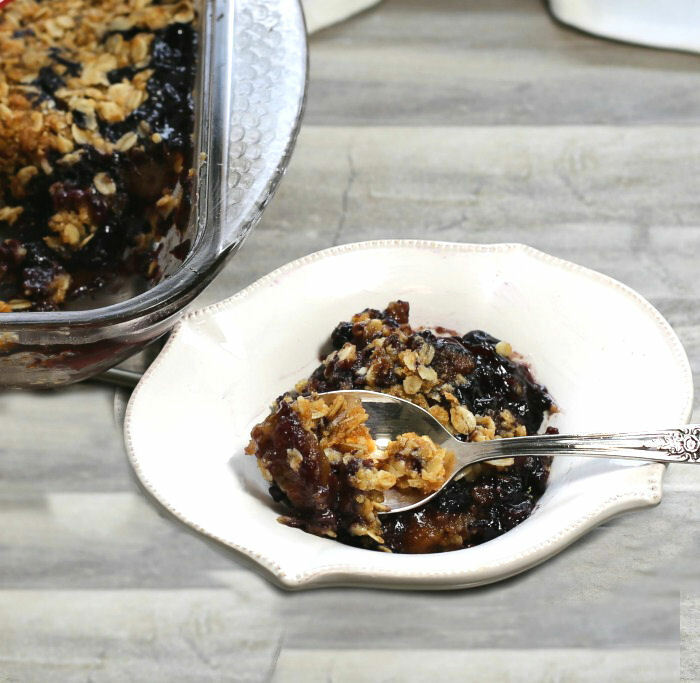 Every bite of this delicious fig crumble just oozes with the flavor of the two fruits. 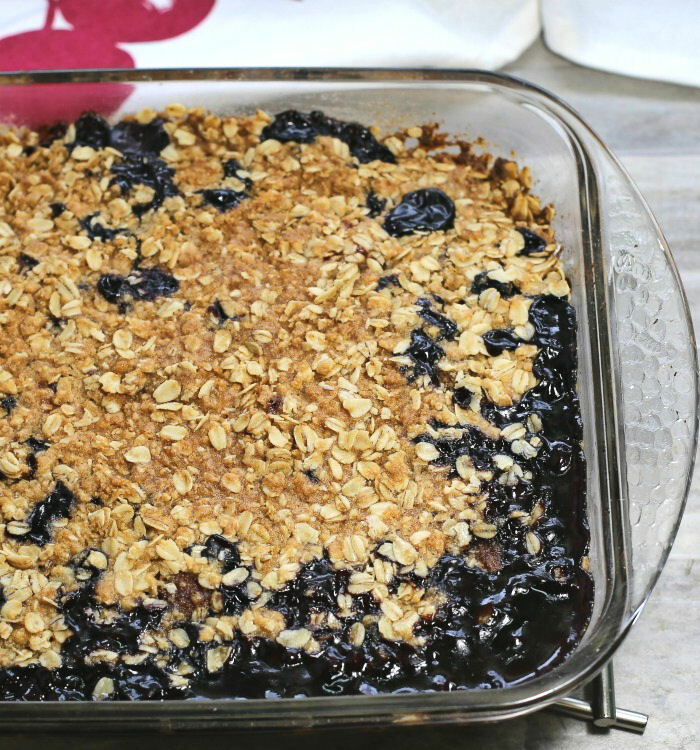 The brown sugar adds some extra sweetness which offsets the tartness of the blueberries. And that topping! So crispy and buttery and delicious. Trust me….you will want to sample this hot, right out of the oven, but the recipe is also perfect served cold. It makes a great stand alone dessert but can also be dressed up with either fresh whipped cream, or vanilla ice cream. I made a big crumble to use up all the figs that we were given, but this recipe can easily be divided in half to make a smaller one if you have to shell out the cash for store bought figs. This recipe serves 12 people with each serving having 339 calories. Not a super light dessert by any means but still reasonable. On the nutritional side, it has lots of antioxidants and is just full of fiber, and low in both sodium and cholesterol. It’s great for a snack or after dinner dessert. Here’s an idea – serve this dessert for breakfast this week! Figs, blueberries and oats all fit in just fine in a breakfast lineup. Shhhh…we won’t mention that your breakfast includes flour and butter and sugar to anyone! Serve with whipped cream or ice cream for a delicious dessert that the whole family will love. If you would like to be reminded of this recipe later, just pin this image to one of your dessert boards on Pinterest for easy access when you want to make the fig crumble. This blueberry and fig crumble is tart and sweet with a crunchy oat topping. Serve it with some whipped cream or ice cream for a delightful summer dessert. Preheat oven at 350°F. Spray a 9 x 13" oven proof baking dish with cooking spray. 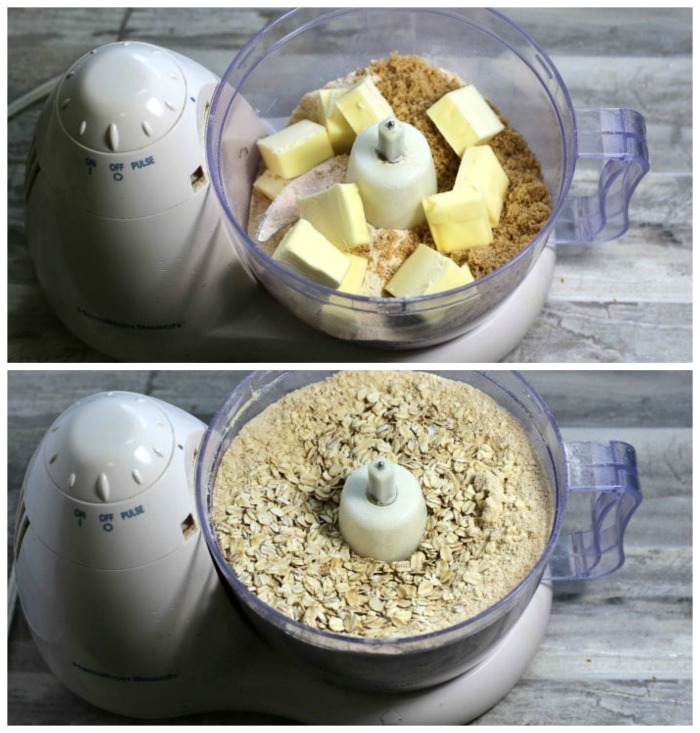 In a food processor, combine the whole wheat pastry flour, brown sugar, and sea salt. Pulse a few times until the texture is crumbly. 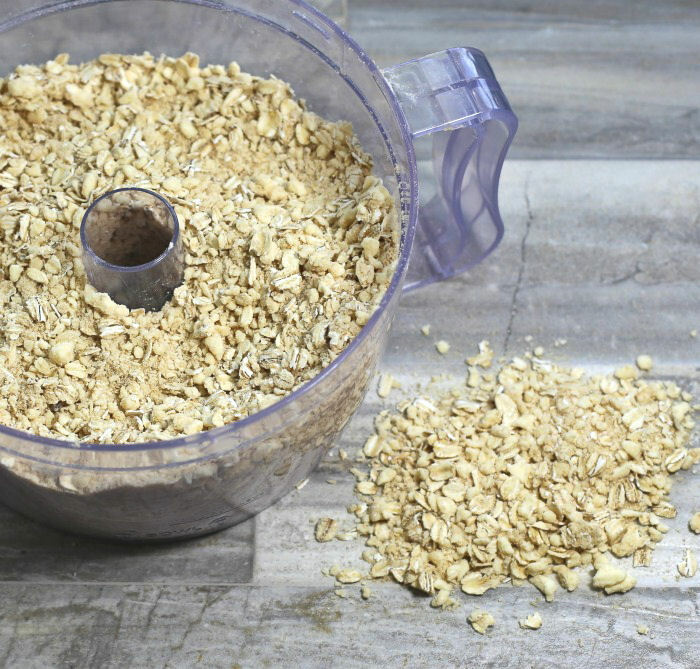 Add in the oats until they are evenly mixed. Set aside in the fridge until ready to use the crumble. 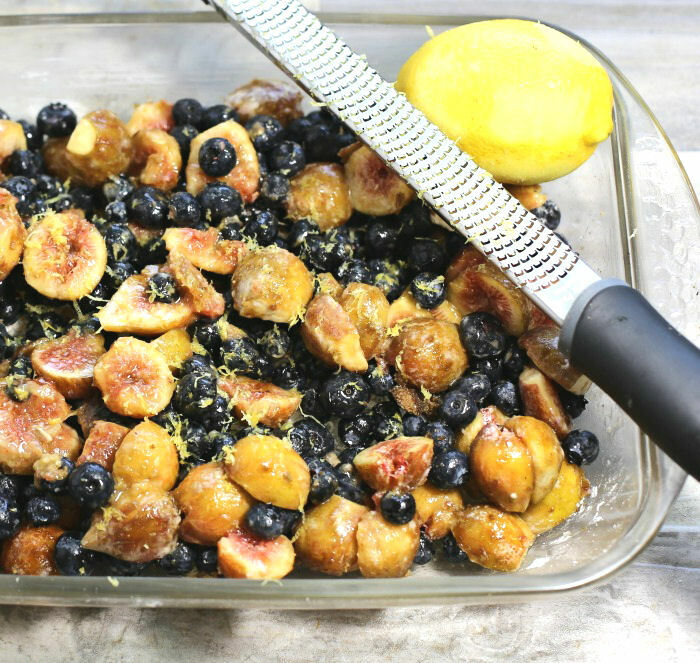 Gently toss the figs, blueberries, brown sugar, cornstarch, vanilla extract, and lemon zest together. You can do this right in the prepared baking dish to make clean up easier. 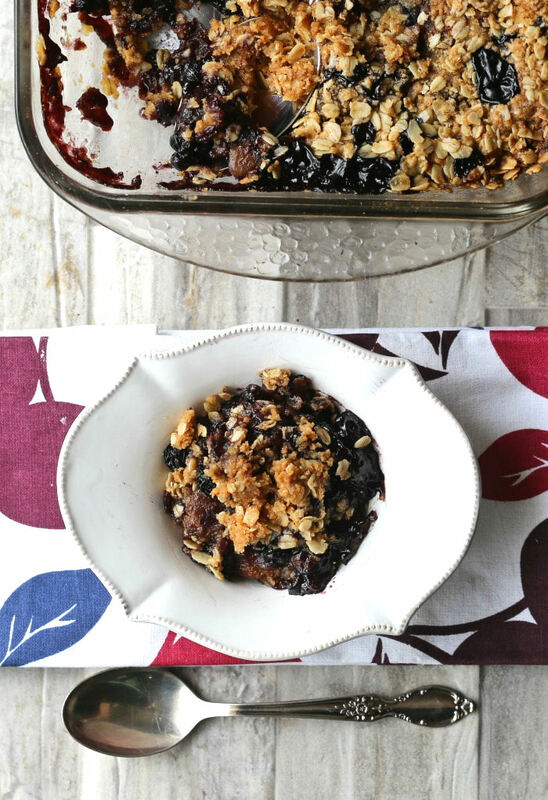 Spread the crumble over the fig-blueberry filling. Bake for 60 minutes until the filling is thick and the crumble is brown and crumbly. If you don't have access to free figs like I did, you can divide the recipe in half and use store bought figs.